Her narration with her South African accent is accompanied on two tracks by pianist/producer Michael Hoppe, concluding with the lovely “Coda,” that Greta says seems to be getting some good radio play. The sounds track is featured on on cdbaby.com, Amazon MP3, and Itunes. 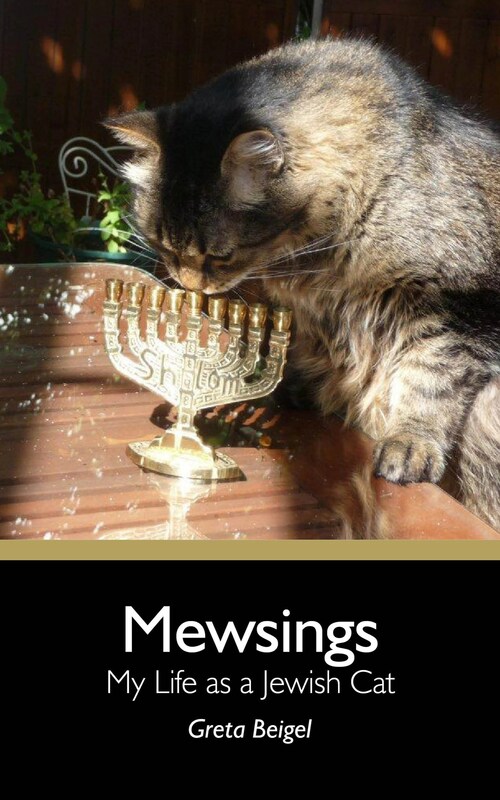 Katzel’s “Mewsings: My Life as a Jewish Cat e-book can be found here. For those of you who aren’t familiar with Hanukkah, it known as the feast or festival of lights. Called Chanukah, Hanukah, or Hanukkah, it celebrates the survival of Judaism over the years. The celebration begins at sundown on Saturday, Dec. 8 and is continues for the next eight days. Families gather, lighting a menorah candle – one the first, two the second – until all eight candles are lit. Special foods, like fried breads and potato latkes are also common during Hanukkah. It is celebrated on the 25th day of the month of Kislev, which can fall anytime from late November through December. It’s often associated with gift giving because of its proximity to Christmas. The first night of Hanukkah starts with special blessings, singing traditional songs, and a time when a four-sided toy called dreidel is used for games. It is a spinning top with a different Hebrew letter inscribed in each of its four sides – the four letters form an acronym meaning “a great miracle happened here”. The hanukiah (or chanukkiyah) is a type of candelabrum that holds eight candles to commemorate the eight days that the oil burned and a ninth candle that sits apart, known as the shamash, or servant candle that lights the others. The eight days celebrate the Jewish people’s successful rebellion against the Greeks in the Maccabean War in 162 BCE. Against all odds, a small band of faithful Jews defeated one of the mightiest armies on earth, drove the Greeks from the land, reclaimed the Holy Temple in Jerusalem and rededicated it to the service of God. A ritual cleansing and re-dedication of the Temple occurred after the Jewish people’s victory. It is believed that there was only enough consecrated oil to keep the lamp burning for one day but the small bottle of oil miraculously lasted for eight days. As a funny or not so funny aside, Greta says, “Itunes has “Mewsings” listed as a Christian gospel album.” Maybe they out to read Paws and find out why that really isn’t politically or otherwise correct. Do your or your cats have any Hanukkah stories to tell? If so, please share.